It only took us about an hour to reach our destination, even with me stopping a couple times for some amazing photos. No matter how often we drive on these passes, it seems we have to stop for photos and a some of that clean, crisp, mountain air. In fact, the drive itself usually rivals whatever we've planned on doing for the day. I'm going to so miss this place! Anyhoo, we spent a few hours at the Cango Wildlife Ranch, which they could have just as easily named "Zoo of the Klein Karoo" - or "Oudtshoorn Zoo". That's not to say that the animals aren't treated well, they are, but some are in fairly small spaces (like the birds of prey and crocs), and I just couldn't stand to see the Knysna Loeries confined to a small greenhouse-type enclosure. Those birds are just too beautiful for captivity. In the same enclosure though, as if on cue, a couple of dainty little blue duikers (a type of fawn) came tiptoeing out from behind the bush, right up to my very fingers for a quick sniff. It was the first (and it may be the only) time I have ever seen a duiker, and they are so cute! Other animals that we saw include wallabies (Lukas got a real kick out of them), pygmy hippos (also a favorite! ), cheetah, leopards, tigers, lions, meerkats, turtles, tortoises, various fish and bird-life, snakes, and your typical petting-farm animals (sheep, goats, pigs, rabbits, and chickens). I don't think Lukas could have possibly enjoyed it any more, and it was small enough that we could easily see everything before he got too cranky and tired. ...the fog approached. By the light of the moon, we could easily see it, rolling over the mountains in thick sheets so typical of this area. I really love seeing that (far more than I enjoy driving in it). It was another special day, in a very special country. Sorry that we were MIA for a couple days. Our cold has gone from bad to worse, leaving us sniffling and sneezing for the better part of the week. Monday was really bad, yesterday was better, and today was best, with the exception of a sore nose and yucky cough. Anyway, being sick in a "foreign" country makes you long to be "home". You want your Mommy, you want family & friends that you can easily (and cheaply) call for sympathy, you want a medicine cabinet filled with medicines that you know and trust, and pharmacists that speak your language and know exactly what to recommend. Oh, and of course a neighborhood Starbucks, for those hot drinks and overstuffed chairs. But alas, there is nothing like that here. Yesterday, I forced myself to get out of the house with the baby for a few hours. We went to a café and Antique shop recommended to us by a friend, in an area called "Groot Brak". The café is called De Dekke, and the food and service was actually quite good. Lukas loved the ducks and geese swimming in the restaurant's pond, and I was personally just glad that he decided not to go for a swim. Oh, and last night I made time to update to his baby site (photos and a journal entry). Today we drove to George for more family photos, a visa extension (which costs 850 Rand, even if you only need a week's extension! ), and lunch at a Mexican restaurant (which we've been wanting to try for quite some time). I also updated my "suitcase" on concierge.com. Check it out when you have some time. It's a great tool! What a great weekend! Wilgewandel Holiday Farm, the Rust en Vrede Waterfall & Dam, George Botanical Gardens, you name it, we did it! Even dinner last night was scrumptious. We had a delicious Pork tenderloin dish accompanied by diced Butternut squash... thrown together by our very own homegrown Chef – Tobi! The highlight of the weekend was without a doubt the Rust en Vrede waterfall, though. It’s about 11km down a part-gravel, part-paved road just North of Oudtshoorn, and it is well worth the detour. Coming from Florida, the land of wanna-be waterfalls, every waterfall I see feels like “the very first time”. Nothing short of awesome! The Wilgewandel Holiday Farm was also quite nice – Lukas for one was a huge fan! He got to see camels, donkeys, pigs, goats, and geese and even got to pet the bunnies. He was also able to play in a miniature house and bounce on a trampoline while we were there. Today was a lazy day, but we did get out of the house long enough to visit the George Botanical Garden this afternoon. It’s not as well landscaped or as large as the Kirstenbosch Gardens (in Cape Town), but it certainly is nice to have at least one Botanical Garden somewhere in between Cape Town and Port Elizabeth! Like Kirstenbosch, the George Gardens are also at the foot of the mountains, making it hard to decide where to walk, in the Gardens, or towards the foothills. Sure do hope we can get back to explore the latter! Well, I’ve come down with a cold, so I think I’m going to turn in early. Hope you had a fabulous weekend as well! Because I would love for this to become a platform for other Mom's and wives living abroad as a result of their partner's deployment or delegation, I want to write a little bit about what "really" happens over here. Sure, we have amazing weekends, and lots of fun trips, but the reality is that there are lots of late nights, followed by extremely early mornings, and if you don't develop a circle of friends quickly, being the non-employed partner can be very, very trying. I don't necessarily want to "air dirty laundry", but I think the only way to reach out to other expat moms is to tell it like it is. I hope to get a comment or email from someone saying, "I know exactly how you feel!". And so on that note, let me share the events of last night with you. Anyhoo, around 7:30 Lukas came down with a fever, but I decided to just keep a close eye on it. We watched the movie (which was really great, by the way!) and the baby dozed off on the couch. A couple hours later, when he woke up, I could tell it was time to take him to bed. Unfortunately, I also had to let Felix outside, and I wanted to take the baby's temperature before putting him down. 11 PM came around, and there was still no sign of Tobi. A woman in town recently lost her husband in a car accident, so when I called his cell and there was no answer, I was a bit nervous. Fortunately, he answered my second call, and said he would be home after he finished up his drink. Before we moved here, we read that Mossel Bay has the second mildest climate in the world. Last winter was very cold, and the thing about South Africa is, they don't really do heat. But everyone swore that last year was the exception, and that this winter would be milder. Since yesterday we have frozen our little fannies off. And it's soaking wet and extremely windy. Not the kind of weather you want to be outside in. We're wearing our fleeces inside, and have our indoor wood-burning grill going at 8 AM, in the hopes that it will make the slightest difference in the temperature. But that's nothing. This morning Rijanah (our nanny) told me that their tin roof leaked last night, and that one of the two beds and the television got really wet. So there are now three adults sleeping on the one dry twin bed. But the thing is, there are probably plenty of people in the township that have it a lot worse. The living conditions for many, many people in South Africa are deplorable. I've been wanting to take on at least one project before we leave. Maybe I could raise enough money to have Rijanah's roof repaired. If I can raise more, I'd like to do a sweater drive for the kids in the township. There are so many children running around barefoot and without the appropriate clothing on days that can be both wet and cold. If you think you can help in some way, let me know. If I could just raise a few hundred U.S. dollars, I think I could make a big difference for some of the children before we go. But I have less than 2 months left here in South Africa, so this would have to happen quickly. Let me know if you're interested, and what you think you could donate. For dinner, Tobi got the lamb shank, and I ordered the beef fillet. And for desert, the Cape Brandy Pudding and Amarula Créme Brulée. To switch gears, this weekend should be lots of fun. Not only are we invited to attend a Rugby party at Deoni's house, but we'll be joining some friends for brunch tomorrow in the teeny town of Albertinia, at the town's hotel/restaurant. 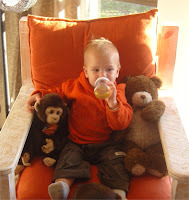 Because I hate posting a blog entry without photos, the photo you see above is a really cute one of Lukas watching "The Little Einsteins" (AKA "EI-TIE") with his bear and monkey friends yesterday morning. At some point you have to make peace with the fact that you will never be able to capture ALL of the beauty of a specific place with your digital camera. You will pass by incredible, flowering trees, vines with leaves that have turned a rich hue of red, huge bushes of yellow flowers, flowering aloe plants, mountains in a misty haze, and you will wish that you could stop for everything... to allow you to commit it to more than your fading memory. I find that I'm in a sort of panic mode now, as a means of coping with the our move to another continent. As a result, I've decided that it's very important for us to cherish both our South African friendships, and the incredible sites of the surrounding area in our remaining weeks here. 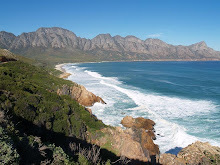 One of my favorite drives is along the road from Mossel Bay to George. You pass by huge Brack-water rivers and grazing pastures, with the mountains as a backdrop and the ocean to keep you company for the duration. I like it so much, that yesterday I decided to take a picture from the driver's seat, so I can remember the exact way I felt for every drive. We drove to George a couple times this week. The purposes of our trips there were to finally visit the Botanical Gardens and to go to our "Top Tots" class. Lukas also managed to spend a lot of time with his little friend Rebecca this week (and I with her Mama, Deoni). On Wednesday we even managed to to a bit of scrapbooking at a friend, Antoinette's house in Klein Braak. Lukas really enjoyed playing with the kids (Deoni & her little ones were there, as well). He got lots of practice on the stairs (gulp!). It's hard to imagine how different things are going to be for us in a couple months. Even though Lukas is so young, I'm not happy about him having to leave the people and places that he's just begun to feel comfortable with. Not to mention poor Felix (our doggy)! He'll be staying with Tobi's parents for a couple months (for which we're very thankful for) until we have the new place and are all settled in The Netherlands. Yesterday, when the florist came to deliver my weekly bouquet for a whopping 10 bucks, I thought to myself, "We're really going to miss this place." And I'm not just talking about the incredible friends that we've made or the unrivaled scenery. Life is good here. Really good. In addition to our fresh flowers, we've been spoiled rotten with a housekeeper and nanny that comes three times a week, eating like kings at some of the country's best restaurants, an incredibly low cost of living (that means shopping at the grocery store without even looking at prices), and being able to "afford" living right by the water. So, you see, no matter where we live, life for us will never be the same. This time next year we'll be living on the rainy, cold continent of Europe. Our house will be a disaster, both because we're hoarders, and because Tobi and I always find more important things to do than clean the house. I'll have a little less "me" time, and a lot more "mommy" time. I'll be picking up my fresh tulips from a Dutch flower stand (that doesn't sound half bad)... riding around with a big wicker basket full of "bloemekes". Our days will be longer, and then shorter... much shorter. But hey, life's an adventure, right? It's all about taking chances... and living in the moment. Speaking of which, I better turn off this crazy computer and get exploring! This Mother's Day we did one of my favorite things - we took a little road trip. We decided to head over the Outeniqua mountains and into the Klein Karoo, in the direction of the Cango Caves. As always, the drive was beautiful, but each time we make that trip, we notice something different. This time it was a hill covered in blooming proteas. Further inland we saw lots of flowering aloe (ferox) plants, with their characteristic orange bloom. What a special treat! When we got to the caves, I suggested Tobi to go on the tour on his own. I know only too well how difficult it can be to enjoy the tour with a crying baby... and an hour and a half is a bit long for the 1-year old attention span. So we set up camp at the restaurant, which really nice. It overlooks the surrounding hills and mountains, and is a popular hang-out for the local birds (a welcome distraction for the little ones). The restaurant personnel immediately took to Lukas, wanting to play with him, hold him, and talk to him. From the restaurant terrace, I noticed some lovely hiking trails. I sure do hope we make it back there for some hiking! As it turns out, it's a really good thing we decided not to join "Da-Da" on the tour, since he wound up inadvertently taking the "adventure tour" - meaning lots of cave crawling and squishing through small openings! He said it was wonderful, though. Another "must-do" for my remaining time in South Africa! On the way back we stopped in Oudtshoorn for dinner at a restaurant called Jemima's. We sat in the back of the restaurant, just next to the garden. The service and food (they're best known for their lamb and duck) there is good, but what I like best about Jemima's is the ambiance. The candles, book shelves, photos, and wood-burning fireplace really make you feel "at-home", making this the perfect ending to my 2nd Mother's Day. Even more special than the dinner though, was Lukas' perfect behavior (despite having skipped his naps) and the belly-laugh he gave us on the way home. At the end of the day, what better gift can we, as mother's, possibly receive, than healthy, happy, and beautiful little people, that help to remind us what life is all about? Recently, I returned to Cape Town, this time with the intention of gathering as much information as possible for future travel articles. 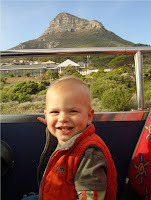 I packed the baby and the nanny into the car and drove 4 hours to South Africa's "Mother City", which just happens to also be one of the world's "must-see" destinations (according to the BBC program "Holiday"). The plan was to leave early Monday morning, arriving in Cape Town by lunch. So much for plans. We arrived shortly after 3 Pm, checking into Cape Town's "Extreme Hotel" in the downtown, or "CBD", area. The hotel is fairly easy to find, using a street map or navigation system (we used the latter). After checking in, we tried out the hotel's restaurant, which boasts 40 milkshake and 30 hamburger varieties. The milkshakes rock, and Ferrero and Lindt are just a couple of the options. The hamburgers are tasty, but seem out of place on their large square platters, surrounded by upscale garnishes and drizzled oil. And in our experience, the service could be better... but then again, we chose to dine outside of standard mealtimes. Adjacent to the restaurant is the pool, and diners can check out the people in the pool through the glass wall. I expected a standard size pool, that one can actually swim in, but the pool at this hotel is more to take a dip in after climbing the rock wall (which is at the side of the hotel - with off-season climbing sessions offered on weekends). What I like about the Extreme Hotel are the affordable and tastefully decorated rooms, great service, and ideal location (just next to Long St., with many top bars and restaurants within walking distance). "Extreme" sports enthusiasts will love the flat-screen televisions throughout the lobby that broadcast skiing, wake-boarding, climbing, etc., as well as the same-day laundry service (great for backpackers!). The following morning we checked out of the Extreme Hotel, had a quick breakfast at an adorably little café called Tangerine (also on Bree St.), then checked into the Cape Heritage Hotel. The hotel was actually on the same street, but closer to the "heart" of the city. Upon check-in, we were warmly greeted and directed to a gorgeous and ultra-comfy sitting room, where we were immediately welcomed by hotel staff, and experienced what was probably the easiest check-in ever. We didn't have to present credit cards or fill out forms. "Simply sign this paper, and we'll show you to your room." -SAVOY CABBAGE. (main entrance around the block): Fusion, international cuisine. A CNN "Hot-Spot". Super friendly staff! -CAVEAU DELI & WINE BAR : Nice food & ambiance. A favorite for locals & tourists alike, all week long! -BESOBAR (or "BesoBar"): Great tapas bar in an ultra-cool setting. Check out the "bedroom" lounge. -AFRICA CAFÉ: All-you-can eat; various dishes from across the African continent. After we checked in and got settled, I left the baby with the nanny (where else can I afford to do this!?!) and went out exploring. I was on Cloud 9. It was like the "old-days" - before the baby. I just strolled down one of the side streets, passing various inviting cafés and restaurants (and struggling not to go in! ), bumping into a huge market (entirely by accident!) at Greenmarket Square, and stopping at the Cape Town Tourism on Burg & Castle Streets for information on the City Sightseeing Bus Tours. After a couple hours, I returned to the hotel to pick up the baby and the nanny, and we caught the City Sightseeing bus for a tour of the city. The tour was very informative, and I saw so many parts of Cape Town that I hadn't yet seen. I wish I would have taken notes, and had we begun earlier, we could have gotten off and on at a couple locations, such as the Iziko National Museum, or the sea-side hot spots of Camps Bay and Sea Point.The bus pass is good for 24-hours, and it stops at most of the city's cultural attractions. We did find time the following morning to make it to something I had been wanting to visit for quite some time - Thandabantu, "A photographic journey through Southern Africa 1919 through 1939" is an amazing exhibit! It's only in Cape Town through the end of June, and is normally housed in the McGregor Museum in Kimberly. Thandabantu is the name given to Alfred Duggan-Cronin, one of the first people to photograph the indigenous peoples of Southern Africa, and means "Man who loves people". One can only imagine the trials and tribulations he must have undergone, traveling to some of the most remote areas in an time of horse-drawn carriages, and when there was even more strife between the races. His mission was to help white South Africans to understand the indigenous people and their traditions. Whether he was successful or not, well that's up to you to judge when you arrive here. Our last stop in Cape Town was Canal Walk, reportedly the largest shopping mall in the Southern Hemisphere, and home to some of my very favorite chidren's clothing stores (like the Pumpkin Patch and Naartjie). After a couple hours of shopping and a quick lunch, we began our journey back to Mossel Bay, taking an alternate route home. Since we were already a bit North of the city, we traveled North to Worcester on the N1, through the Brandwacht Mountains and Breede River Valley, towards the winery town of Robertson, through Swellendam, and back onto the N2. Oh, and in Worcester I did a big "no-no". I picked up a woman hitchhiking on the side of the road, with her 2-year-old son. I passed her initially, but I thought, "How long has she been standing there?" and "How would I feel if I had no other means of transportation and was forced to stand on the side of the street for hours with Lukas in my arms... hungry and tired?" So I turned around and stopped, keeping a wary eye out for any schemes or dangerous looking people, and asked her where she was going. She said Robertson, and so we took her along. Her son had the saddest expression on his face, that is, until he got a balloon and cookie from the "Auntie" that was driving. I'm so happy we were able to help her. As it is, she said she was standing there for over an hour. Other than that, our trip "home" was pretty uneventful, and we arrived home around 5:30 that evening... to a very happy puppy (and husband). South Africa: A Nation Divided? South Africa is an amazing country, and in July, when I watch her for what might be the last time from my plane window, I'll be fighting back the tears. Having said this, it's also a puzzling country. People here have mixed emotions. Regardless of whether you're in a township or a gated community, you'll see fear and intolerance coupled with hatred and violence, but in that same community you'll see hope and compassion accompanied by solidarity and pride. My friend Deoni says that there are times when she's ashamed to be an Afrikaner. I find that hard to imagine, since Deoni eats, sleeps, and drinks Afrikaans. Her family and most of her friends are Afrikaans, and she grew up in a very Afrikaans region of South Africa. Why would she be ashamed? Well, apparently, there's a new cell phone text message going around that's extremely racist and quite frightening. It's a re-write of the South African national anthem, which I'm going to try to track down, translate, and add to this blog. But in addition to these types of messages, there are rumors going around that when Nelson Mandela dies, there will be a mass-slaughtering of all white South Africans. Deoni added, "But most white South Africans have a gun at home, and we won't go down without a fight." The thought of such a massacre sent chills down my spine. We shifted the conversation outside to shaded table under the Milkwood tree, just in front of her Italian-style villa (but inside the compound-like concrete walls). Deoni's one of the privileged white Afrikaners. Life for most black and brown (AKA "colored") Afrikaners is much different. Last Sunday we were invited for dinner at Rijanah's house for the first time (that's our part-time nanny). Tobi wasn't thrilled about the prospect of having dinner in a township, but I explained to him that this was really an honor. Rijanah trusted us enough to invite us into her home, without fearing that we would ridicule or laugh at their simple way of life. Picture four adults living in a house the size of a typical American bedroom. There are two twin beds right next to each other, and the room is divided by a cupboard, on the other side of which are the chairs which make up the living room. Unlike some, they do have an indoor toilet. Their sink drains into a bucket (which I found out after pouring left-over wine down the drain). Dinner is usually cooked outside in a "Potjie", a large iron pot (placed on top of a fire). Since it was Rijanah's birthday, and they knew we were joining them, they bought the expensive stuff - Lamb knuckles. They prepared it with a nice gravy, potatoes, and rice. While we were waiting for dinner, we tried our best to keep Lukas from running into the streets to play with the older kids. A couple times I walked with him, though, and the little (black) boys were very curious about us, the strange (white) visitors. They had a self-made scooter thing, made out of rusty metal, and Lukas insisted on riding on it. The children were mostly very polite, but the adults that walked by were a bit overwhelmed by our presence. Especially the men. There were a couple men that stared at me far too long, turning their neck to continue to stare long after they had passed. In one instance in particular, it was a cruel sort of stare, as if they would rather see me roasting on a spit above the fire. Life in the township can be very hard, so it comes as no surprise that some people are resentful of the "whites". All-in-all, our township dinner was pleasant, though, and most certainly authentic. In Cape Town, you can pay to do a "township tour" (but I don't think you get to have dinner at someone's house!). What I like best about township-life is that the children still play outside, and they seem happy, despite their simple life. Life goes on. According to American TV journalist Matt Lauer (who was here last week), the government has everything under control, and townships will be non-existent within a decade. That sounds great in theory, but living here, you get an entirely different impression. Many white people feel threatened. They see "Black Empowerment" as reverse discrimination, resulting in increased crime and future unemployment. Many consider their "national sport", Rugby, to be under attack, thanks to new rules which require teams to pull in minorities, regardless of size and skill differences. But I have great faith in this country and its people. It just doesn't feel like everyone's ready for change, but my hope is that in a decade, people will be hired and promoted based on skill, not skin color or gender, and that whites and blacks will be seen dining at the same establishments throughout the country (and not just in pockets). Good luck South Africa. You can do it! In America, Germany, and many other countries, festivals are fun for everyone, no matter what your background or native tongue. I wrongly assumed that this was a universal truth. 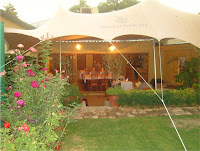 The first festival, was the KKNK in Oudtshoorn. We thought it was just bad luck. The program was solely in Afrikaans, nearly every event was in Afrikaans, we got turned away from three different venues for various reasons, and it was a sweltering hot day. Surely, this was just a fluke? A couple months later, we decide to try Prince Albert's annual "Olive Festival". Prince Albert is supposedly only a couple hours from Mossel Bay, but when one tries really hard, it IS possible to get terribly lost along the way, backtrack, try the same route again, and arrive in Price Albert four hours later (don't try this with children). Which is precisely what we did. Fortunately for us, it wasn't nearly as hot as in Oudtshoorn previously, but even in pleasant weather, I wouldn't recommend doing a 2-hour walking tour of the historic landmarks with a 1 year old (Oh, the things you learn as a first time parent). Another point to remember: If you plan on ending the day with a yummy piece of Karoo lamb at a nice little restaurant, think again. Not without a reservation. And I can tell you from experience that it doesn't matter how much you beg and plead. There are only 3 restaurants in Price Albert, all of which were fully booked that evening. So we thought, "Gee, we have to drive through Oudtshoorn to get home anyway, let's just stop for dinner there." Silly us. It was a Sunday night, and after trying in vain to get a table at 3 different restaurants in Oudtshoorn, we gave up, and began our hour and a half journey back to Mossel Bay. Yesterday we did another "family hike"; this time here in Mossel Bay. I know, I said we'd start a family tradition of Sunday hikes, but it was a long weekend here in South Africa, so we did our family hike on Tuesday. :-) We kept postponing it. Saturday didn't work, because the weather was bad and we had a lazy day at home; Sunday didn't work, because we did a road trip North to Price Albert; Monday didn't work, because Tobi had to go into the office; and so Tuesday HAD to work, despite the dense fog and constant blow of foghorns. -Quietly observing a big green praying mantis on his sleeve. When he noticed it, he just stayed very still and looked intriguingly at it, like, "isn't this an interesting little creature on my shirt?" -Walking around with the phone to his ear, laughing into the phone, as if Ga-Ga's on the phone and she's telling a funny joke. No matter how often I see that, it always makes me laugh. -"Goobagoo" for Peak-a-boo (which is also the name for Pooh Bear, but I guess those terms sound similar for him). -Calling my breast "Diddle-doo"(when he wants to nurse). I have no idea how he came up with that, but it's so sweet! -Saying "ComeBecca, ComeBecca, Come" to his little friend Becca. -"Cheep, cheep, cheep" when he saw the "little chicks". He's so proud of himself. Now, when I ask, "Lukas, what do the Little Chicks say?" He answers, "Cheep, cheep, cheep!" Well, I guess that's about it from our side. We only have a couple months left in South Africa, so we're trying to enjoy it as much as possible, and see as much as possible in our remaining time. On that note, I'm off to walk the dog and check out our neighborhood Springbok.